We’re in New York this week to bring you coverage of Singularity University and CNBC’s Exponential Finance summits. Bitcoin, blockchain, mobile banking, peer-to-peer lending, AI financial advisors, insurance and driverless cars, and more: The financial world will undergo significant change in the coming years. Come here for the latest from the frontiers of finance and technology. As late as 1968, the New York Stock Exchange was still paper-based. Reconciliation of trades was done by hand; every transaction required parties exchange a physical stock certificate; young men literally ran sheaves of paper firm to firm. 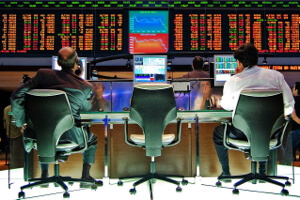 Since the stock market was first introduced to computers in the 1960s—it hasn’t looked back. From those earliest terminals to today’s lightning quick high-speed trading algorithms, the trillion dollar financial industry breathes ones and zeros. But that transition back in the 60s? That didn’t happen overnight, nor was it universally embraced at first. And now, we may be on the verge of another big change. Though technology and computing transformed the how of finance—the what remained largely intact. Nathan Rothschild or JP Morgan might not recognize every product at a modern bank, but they would surely understand how the company makes money. They would no doubt be awed by the speed of information (and the paper thin edge it affords), but they would also grasp the connection between a tweet or email and a carrier pigeon or telegraph. In a presentation at Exponential Finance this morning, Brett King, founder of fintech startup Moven, said, “Monte dei Paschi di Siena, the oldest bank in the world…is 750 years old, and you could argue that their model of banking hasn’t fundamentally changed.” But the days of Morgan, Rothschild, and traditional banking may be numbered. According to King, there are 8,000 financial technology startups in the US and 25,000 globally. The future of banking isn’t in branches—it’s online and mobile. For future generations, trust won’t require a flesh-and-blood handshake. A quick poll of the audience revealed the majority hadn’t visited a bank branch in the last six months. Put another way, bank branches aren’t scalable now—just as paper transactions weren’t in the 60s. And it isn’t that we’ll do away with bank branches at some point in the future. We’re already doing away with them. Right now. It may start with banks and branches, but it won’t end there. For example, much of the financial world makes money in the middle, orchestrating and settling trades and contracts, taking deposits and making loans, advising clients and investors. Emerging technologies threaten to automate the middleman—making some skills obsolete. 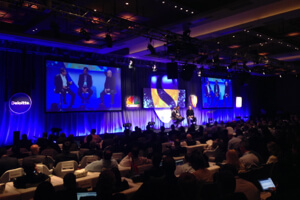 Singularity University and CNBC’s Exponential Finance 2015. Blockchain, the technology behind Bitcoin, automates verification and settlement across a distributed network of computers and compensates them in the currency they’re verifying. Artificial intelligence is improving at learning, pattern recognition, and communication. How long until it provides basic analysis and advice? Sounds like science fiction, but given the exponential nature of these technologies, it may very well be sooner than you think. What other accelerating technologies are poised to transform finance; who’s embracing them now; and how do we stand to benefit from this new financial era? We’re at Exponential Finance this week to find out. Stay tuned.